The plan for Glasgow was very different to what we have today, the city was going to be unrecognisable in many, many ways. Some plans just don’t work out. Emerging from the horror and brutality of the Second World War Glasgow was surprisingly unscathed compared to many other European cities. Yes, it had suffered bombing in the early part of the war and, of course, nearby Clydebank had experienced extensive devastation but the centre of Glasgow, the heart of Scotland’s largest city, the industrial powerhouse of the empire, the beating heart of the heavy industry that powered much of the world, was largely intact. That was the problem. In 1945 Glasgow’s Master Of Works and the city’s Chief Engineer, Robert Bruce, produced plans that would have transformed the city centre. Not only would the majority of warehouses and markets that today make up the Merchant City have been demolished but so would Central Station, the Mackintosh designed School of Art and, arguably the city’s finest building, the City Chambers. These awe-inspiring architectural masterpieces would have been pulled down and a new ‘Modernist’ inspired city centre built in their place. Try and imagine a new city chambers built on the north bank of the Clyde, with new law courts beside them. The city would have two new train stations, one roughly where Queen Street Station stands today and new huge ‘South Station’ built on the south side of the Clyde close to the river. Literally thousands of new buildings would need constructed, business and people would be decanted, streets disappear, familiar landmarks reduced to rubble and replaced with grandiose civic centres and new arterial roads. Its scale and ambition was breath taking and it was actually given initial planning approval by the city corporation. An exhibition at the Kelvin Hall was planned for 1947 where the plans for the new city would be shown to the public. Thankfully a mixture of public concern, political influence and simple economics led to the Bruce Plan being shelved before the exhibition could take place. Whilst you could admire the ambition of Bruce, he lacked the understanding of what makes a city great; namely it’s people, and you underestimate the people at your peril. This weekend might just see another plan for Glasgow begin to unravel. Rangers weren’t meant to challenge again. The club had been dealt if not a fatal blow certainly enough hits to put it down and keep it down for a long time. Or so some people hoped. With unfettered access to the Champion’s League and all the money, profile and prestige that goes with it Celtic, this weekend’s visitors, were ideally placed to capitalise on whatever Machiavellian plans European football’s elite have next. They could hoover up all the sponsorship, corporate hospitality and public identity the city has to offer too, after all who was going to stop them? Rangers, a seeming basket case a matter of months ago, were a club unable to attract the Rangers supporting, Renfrewshire based Aberdeen manager, a club unable to win three games in a row, a club unable to defend a lead at home. Yet, here we are. Where are we exactly? Well, we’re second in the league, unbeaten in the last six matches and have only lost once this year. So we’re not where we want to be but we’re a lot closer to it than we have been for a while. It’s not just the victories that have excited the support, it’s their manner too. We’re fluid, fast and well balanced. Goals are being scored across the team, chances are being created regularly, players are linking up well, there seems to be an understanding now particularly middle to front. More pleasingly we seem to have some fight about us again. We win the 50/50s now, we’re competing all across the pitch, we’re not being bullied and put off our game. It’s remarkable to write this, as this team is really only two months old. The signings of Murphy, Docherty, Martin, Goss and Cummings have galvanised, strengthened and improved a squad that stuttered from week to week prior to their arrival. Added to that we’ve seen Tavernier and Windass emerge as important players, Bates now looks like a Rangers defender and Morelos gets the kind of service and support his superb forward play deserves. This has all been achieved under the guidance of a rookie youth team manager forced into the hardest job in Scottish football whilst the club very publicly courted someone else. It’s funny how some plans don’t work out. Before I get too carried away a word of caution. This Celtic side are still capable of scoring goals and winning matches. Their form hasn’t been as good as last season but it’s still better than anyone else in the league and we’d do well to remember that. They have some injuries and some players seem to be out of form, but they’ve still only lost two matches all domestic season and have the experience and confidence to harm us if we’re not careful. Whatever our current feelings of renewed confidence we’ve not beaten Celtic since that glorious day at Hampden two years ago and a lot has changed at both clubs since. Sunday will be a stern test and one we’re not favourites to win. I’d be surprised if our starting XI is very different from the side that’s largely picked itself in recent weeks. If fit I expect Murphy to return to the side at the expense of Cummings. Foderingham should also return for league duty. Tav, Bates and Martin should start alongside the only real quandary in the side. A fit Wallace should be our first choice left-back but I’m not sure he’s as fit as he needs to be yet. A run out in a friendly against a Championship side is no preparation for a top of the table challenge. 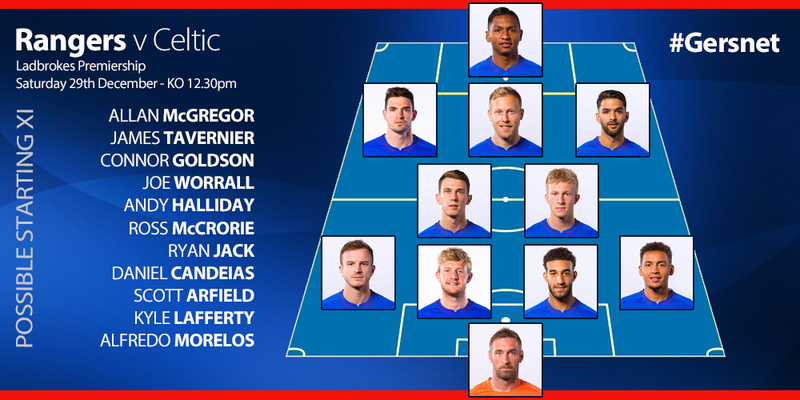 If fit John will start, if not I expect Halliday to play at left back. I expect a midfield of Candeias, Goss, Docherty and Murphy with Windass and Morelos up front. That side has four players making their ‘Old Firm’ début, a match where experience counts and our central midfield is young and has only played a handful of matches together. Amid my expectation and optimism the realist in me is a little nervous. Despite that we shouldn’t lose sight of the fact that it wasn’t meant to be this close. We were meant to be languishing somewhere between Aberdeen and Hibs, turning baliffs away from Edmiston Drive, watching our best players leave for sweetie money and our signings struggle to meet expectations. We’re supposed to be bystanders watching Celtic’s procession to another league title and potential Champion’s League spotlight. That was the plan. Sometimes even the most ambitious plans, whether well intentioned or nefarious, don’t come to fruition. Glasgow doesn’t belong to Celtic, never let them forget that, this is our city too and they don’t get to redesign it without our permission. It’s pleasing we’re not giving it again.